Airline Acronyms Not quite the way it is written on the side of the aircraft. Aircraft Nicknames Some pet names for our aircraft. 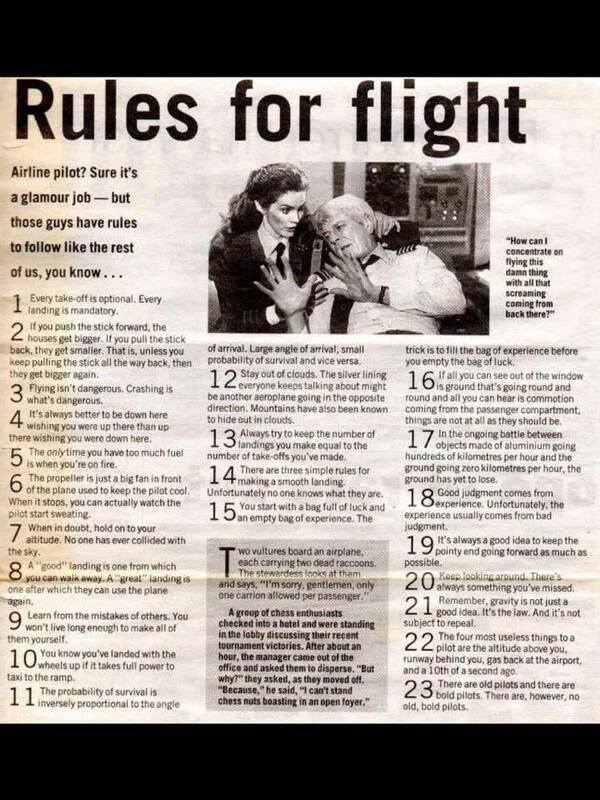 Rules for flight The rules pilots live (and die) by. Why I Want to be a Pilot A childs eye view of the best job in the world. Pilot Jokes Not all mine but collected from various places, email me some more. Flight Attendant Humour What they really mean to say. The Home-Study Simulator Course - For aspiring airline pilots. Travel Agents Tales Why the public should never be allowed to travel. Why aeroplanes are better than women. Safety On Board Does your airline's safety instructions card suggest this to you? McDonnell Douglas Copy of a questionnaire that actually appeared, briefly, on the MDD website. About Captains Probably written by F/O's. Flying Poem A modern interpretation of an old favourite. The Full Circle Proof that the grass is always greener. Flying Quotations A collection of great one-liners. TRE's Comments Seen any of these on your progress reports? Nicola's Drawing Just in case there is anybody who has not seen this. Mile High Club Following a recent high profile case the MHC is now in the US FAR's. Captain 1.0 Also probably written by the F/O's. Tech Log Some allegedly true tech log entries by pilots.